This past week we visited the lovely town of Vang Vieng, halfway between Luang Prabang and Vientiane. The town was nestled among a picturesque range of limestone karsts, the Nam Song river, and colourful buildings. The incredible scenery nearby has turned this small community into a backpacker’s haven, and you can see the effects everywhere. With bars lining the roads, shops selling neon shorts and tank tops, and restaurants playing endless reruns of Friends, South Park and Family Guy, it was a little disheartening to see. The town was still lively with local culture, but you definitely had to look past the drunk westerners to see it. 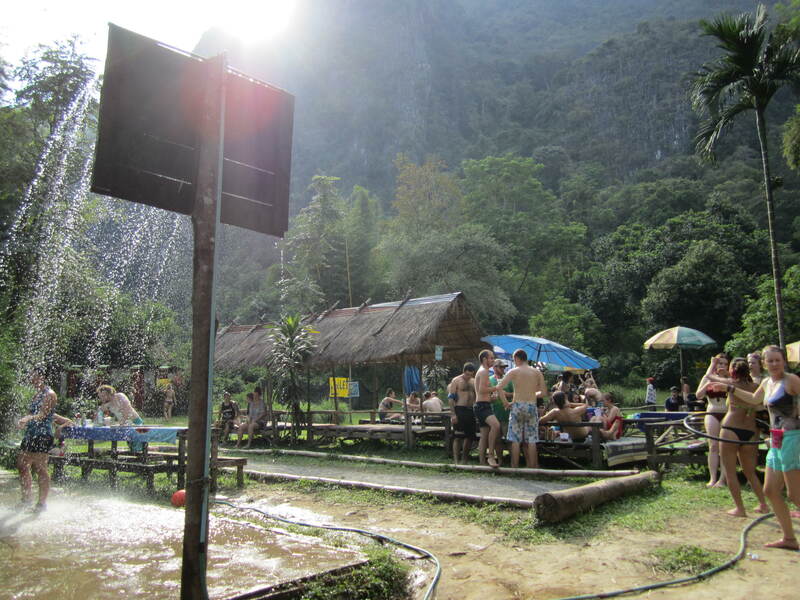 We had heard that Vang Vieng was famous for its parties and tubing. In 2011, the hospital recorded 27 tourist deaths and countless injuries that occurred in the river. People would tube down the river, stopping at each bar along the way to get drunk on free shots of whiskey, try a magic mushroom shake, or swing into the water on ropes. There were no safety standards, and the fluctuating river levels hid logs and rocks from view. Nowadays, most of the bars are shut down and the ropes and swings are no where to be seen along the river. Despite the dark past of tubing, it’s still an extremely popular and fun thing to do. There are only three bars open on the water now (six total, but they alternate days). We decided to give it a try when some of our friends we’d met encouraged us to come with (and yes, after much reading and researching on the safety nowadays). After renting a tube and signing a waiver, we were dropped off at the tube launch. This was also the location of the first bar, and the party was in full swing by the time we arrived. Electronic music was blasting, and people were playing drinking games like flip cup, beer pong, and shotgunning beers. Whiskey shots are free and plentiful in Vang Vieng, since it’s a cheap local product. We decided to skip the first party and head right to the second bar. We got in our tubes and floated about two minutes down river until we were thrown a rope and pulled in by some locals. The bar was really fun. There was a basketball court with water blasting out of the backboard, hammocks aplenty, and the obligatory soundtrack that included every Western hit from 1990-2010. We played beach volleyball with a bunch of Canadians teaching English in Malaysia, which was a lot of fun. Most were from Toronto, and on was from Halifax. The sun was scorching hot, so when it was time for a break, we decided to trek to the Lom Cave. After walking several hundred feet up bamboo stairs, we got to a rather unimpressive entrance. The opening was about the size of a double door, and there was a set of stairs descending down into the wet limestone. Using the flashlights we had been given, we explored onwards. After about 200 feet, the cave tunnel suddenly opened up into a room that would easily fit the average high school gym. The locals had built a small Buddhist shrine here, and apparently the cave kept going much further, had we had the time the explore. Once we got back down, the party was in full swing as everyone from the first bar had now made their way here. Our friends from the hostel had also arrived, and we joined them for some lunch. We spent a total of $3 CAD for a plate of sautéed vegetables and a sandwich. Girls were dancing on tables in bikinis and taking selfies. Buckets of booze flowed freely and everyone was in high spirits. It felt like a freshman spring break, in the middle of the jungle. The whole tubing trip takes a total of two hours to get downriver, and since we were only five minutes in and the sun was moving behind the mountains, we decided to hop back into the water. The last bar was a bit dead, probably because the rest of the party was still behind us. So, decided to finish out our tubing journey. The view from the river is stunning and drifting slowly in a tube has got to be the best way to take it all in. 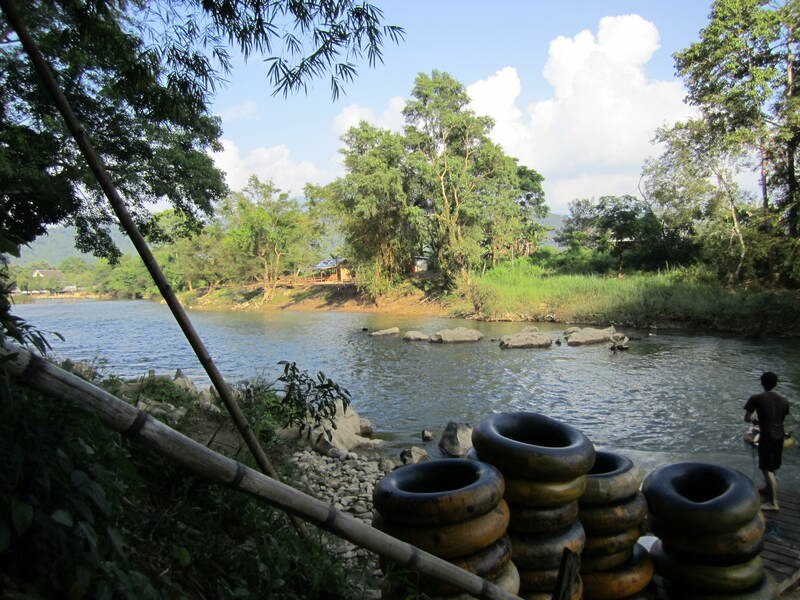 We saw men working in rice fields, kids throwing fishing nets, and a cow swim across the river to join his family. At one point we came upon little local boys jumping off a small bridge into the water. As we got closer, they spotted me and raced towards my tube. Luke pushed me closer to them, and once they caught me, they hung on for dear life as I floated towards the bridge. Laughing and splashing, they were ecstatic until they eventually hopped off to climb back up on the bridge. 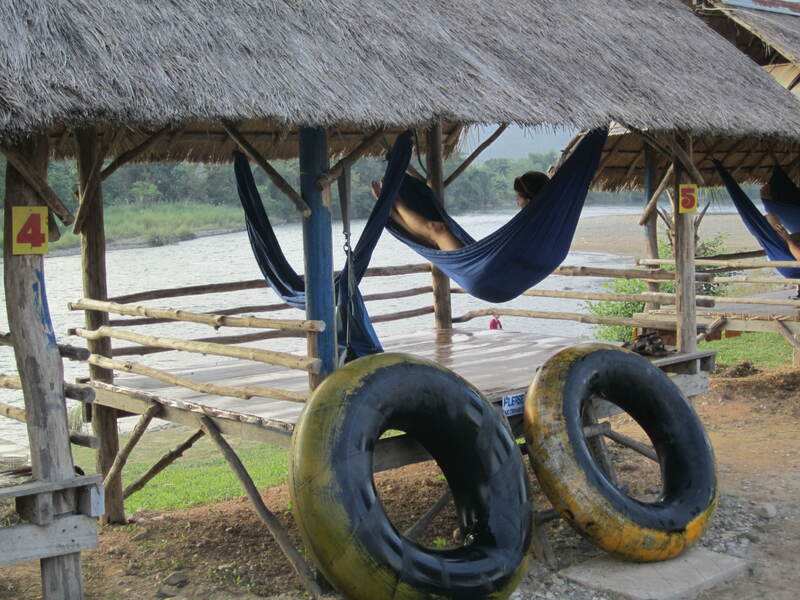 I guess in Laos it’s the little things, like commandeering a stranger’s tube for a few minutes! Finally our journey came to an end, and the last stop had a gorgeous bar with hammocks and cabanas situated to watch the sun set over the mountains. Snagging a cabana with two hammocks, we dried off and watched the view while drinking smoothies. At $1.25 for a banana chocolate smoothie, with relaxing music playing in the background, we were finally at a venue where we fit in. Ha ha- this is like a perfect day for you guys, isn’t it?? Rave culture meets local interaction. I still can’t help but feel a little disgusted by the party scene right in the middle of such a potentially cultural and peaceful day… It reminds me of when I went to Greece and only saw “BRITISH FOOD” signs everywhere. Regardless- beautiful end to a really full day! :D. Loved it!